Developed and released by Nucleus Gaming, 12 Animals Slot machine is a presented to the players in 5-reels and 30 fixed paylines. Nucleus’s slots content is very similar to Betsoft’s, so it has stunning graphics, amazing design work and of course fun gameplay. 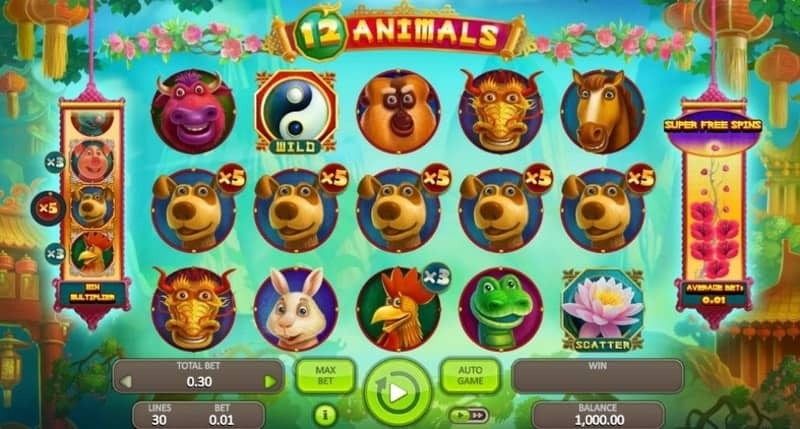 12 Animals 3D video slot offers various betting option and its coin denomination start at 0.02 and goes up to 1.00 with the maximum bet being set at 150 coins. There is a double-up feature available, so you can multiply all your winning combinations by playing all coin game and guessing what’s next heads or tails. You can always activate the auto-play feature and let the sot spin for you. 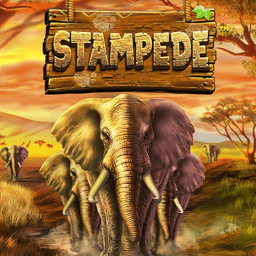 If you are looking for BIG wins, 12 Animals slot machine is the perfect choice as it offers a 750k coins jackpot. 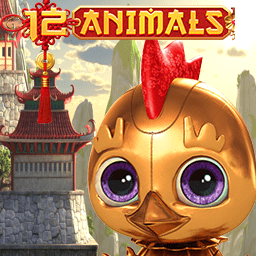 12 Animals slot theme is a Chinese-folklore themed online slots game in which the developer emphasizes the Chinese zodiac with the 12 animals appearing on the richly-animated reels. 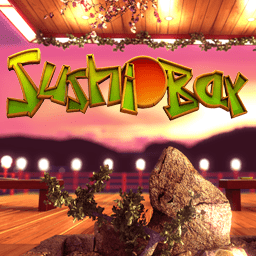 This video slot takes you on a fascinating journey to a lovely Chinese village. As you spin the reels the background will chance with every 30 spins following the 4 seasons sequence. The game play in 12 Animals slot works is fully packed with some great features which will help you win substantial cash prizes. The theme-related symbols on the reels consist of dog, sheep, pig, roosters, rabbits, snake, all 12 animals present on the Chinese zodiac. The cat symbol serves as Wild in 12 Animals slots game play, with the power to substitute all the regular symbols to help you trigger some decent winning combinations. The Yin and Yang symbols acts as Scatter symbol helping you to activate the Bonus features. 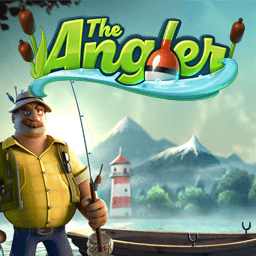 An impressive feature offered by the developer are the blocks of identical animals which when appearing on the reels they provide multipliers up to 10X. There is also a seasonal wheel present in the bottom-left corner which will start moving as you spin the reels. It shows when the seasons change and which animal from the main game becomes the golden symbol. 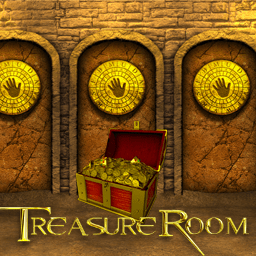 If you manage to hit a winning combination with the help of the golden symbols you will win 10 times more than usual. To activate the Free Spins bonus round in 12 Animals slot game you must land 3 or more Yin and Yang symbols anywhere on the reels. The free spins are played with the same wager as the triggering spins. The bonus feature for this online casino game can be re-triggered by landings additional Scatter symbols during the free spins round. 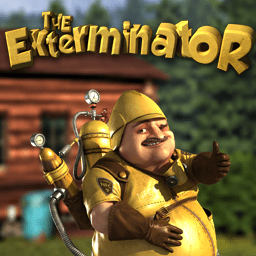 For 3 Scatter you will receive 8 free spins, for 4 of them you will be rewarded with 12 free spins and for 5 Scatter you will get 20 free spins. In summary of this online slots review, Nucleus Gaming 12 Animals Slot game is creative and entertaining. The game is packed with features to help casino players win, and that what we like to see! Casinos Online Review recommend you try 12 Animals slot machine and see for yourself the amazing graphics and “zen” feeling as the seasons change. 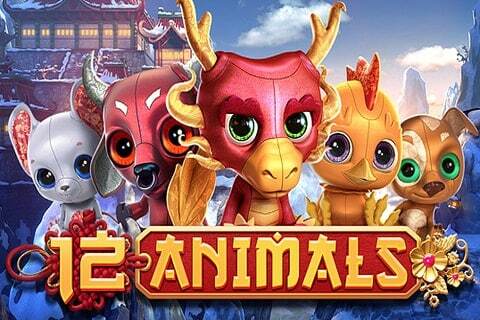 Play 12 Animals in the free slots section of our casino GAMES ROOM. Play Nucleus slots for real money at one of our recommended Nucleus Casinos below. As always, Good Luck and Good Fortune! Register today at MegaVegas Casino and get 50 FREE SPINS plus a sweet 300%/200%/250% Welcome Bonus Package for your First Three Deposits. New MegaVegas casino members will get 50 FREE Spins worth $30 just for signing up. Real cash players can then select the Welcome Bonus offer for their first THREE deposit. Players 1st Deposit gets a 300% Match Bonus plus 50 Spins. This offer is valid for one person per household and has a 35x rollover on it for Slots, Keno and Scratch Cards and a 10% rollover on Table Games and Video Poker. The total welcome bonus value is $7,500. Terms and conditions apply. 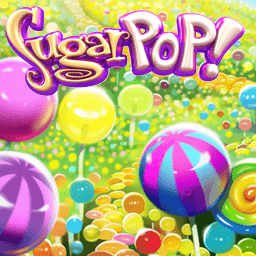 Register today at LuckyBetz Casino and get a $25 CHIP plus 25 FREE SPINS plus a sweet 200% Welcome Bonus Pack on your First Three Deposits. New LuckyBetz online casino members will get a No-Deposit Bonus worth $55. Real cash players can then select the Welcome Bonus pack offer of a 200% Match Bonus for their first THREE deposits. This offer is valid for one person per household and has a 35x rollover on it for Slots, Keno and Scratch Cards and a 10% rollover on Table Games and Video Poker. The total welcome bonus value is $6,000. Terms and conditions apply.